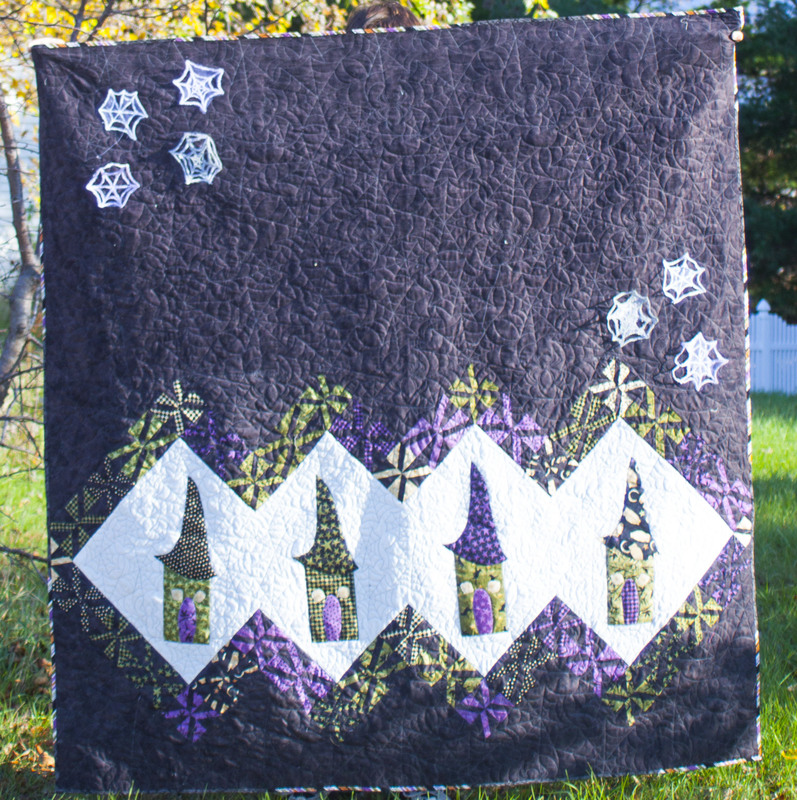 I fussy cut the eyes/windows in the witch-y houses so that the spiderweb prints would look like eyes. 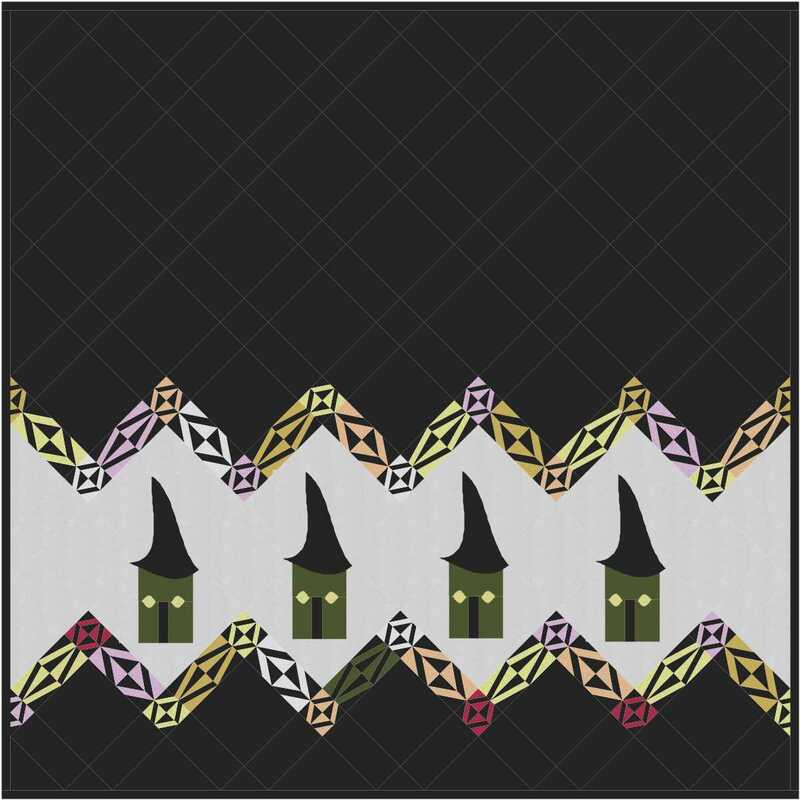 Each house has a door/nose using a purple background print, the houses/faces are a green print and the roofs/hats are a black background print. I used fabrics from the Black Cat Crossing line and some solids which were in my stash. 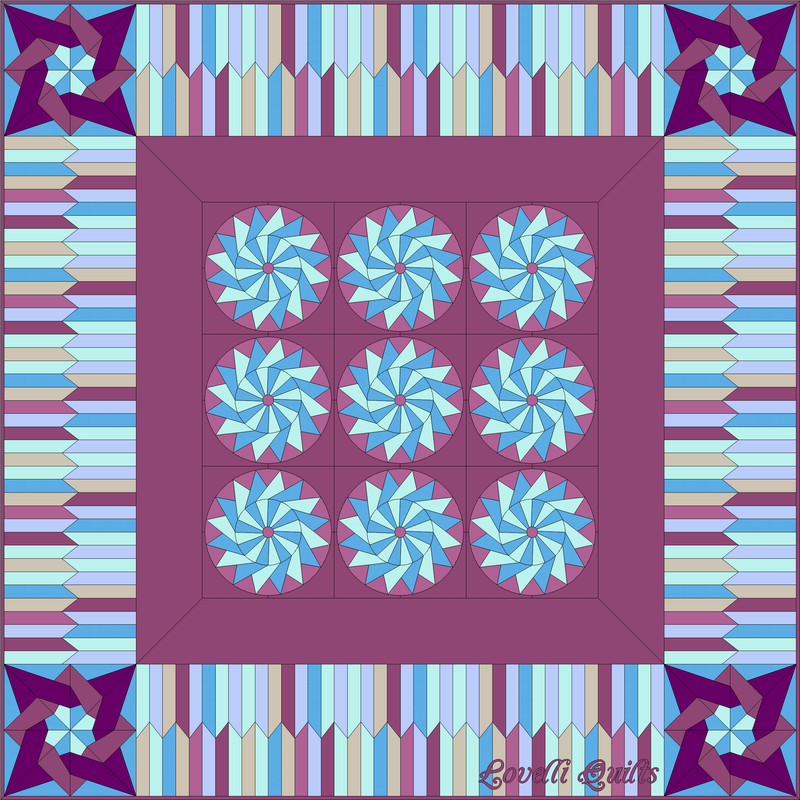 The web quilting design was by Jessica Schick. The spiderweb embellishments were free-motion free-standing lace. They were definitely a spooky addition and easy to make. 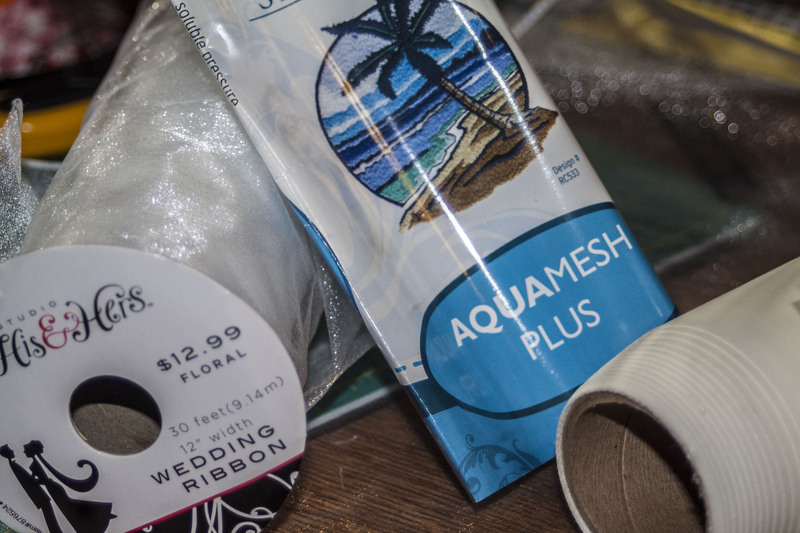 To make the webs I started with Aquamesh Plus, a water soluble stabilizer, Bridal organza and embroidery thread. 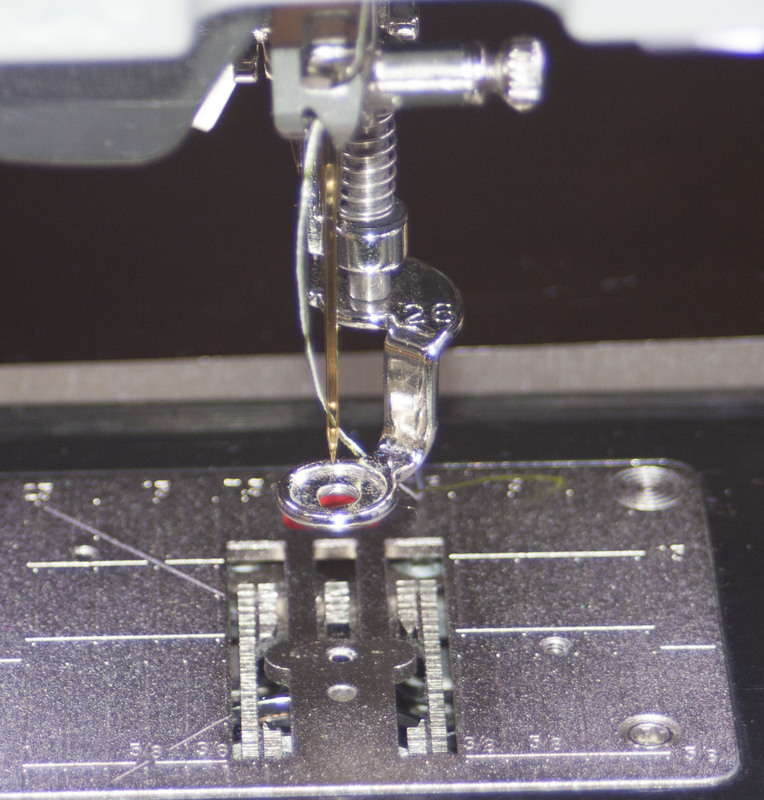 I set up my machine for free motion stitching, lowered the feed dogs, installed the free motion foot, changed my needle for an embroidery needle and installed the straight stitch throat plate. Please consult your sewing machine’s manual for how to do this. In order to stitch the colored webs, I threaded both white and colored threads through the machine as if they were one thread following the same path. Both threads should be threaded through the one needle. Please consult your owner’s manual if this does not work on your machine or if you have excessive thread breakage. I stuck the adhesive side of the stabilizer to the bridal organza ribbon (after removing the wire from the ribbon) then I hooped them together in an embroidery hoop. I used a 7 inch diameter hoop. 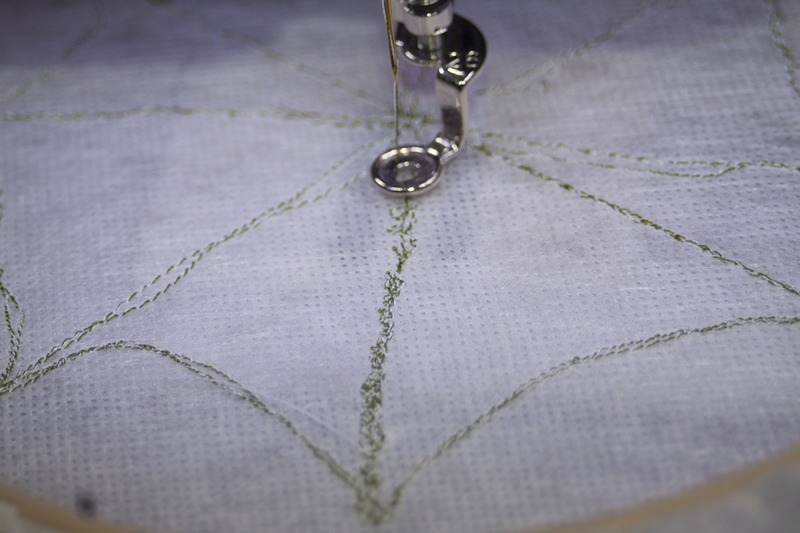 If you are insecure with your free motion stitching drawing ability I suggest that you draw your web on the stabilizer/organza with a water soluble marker. 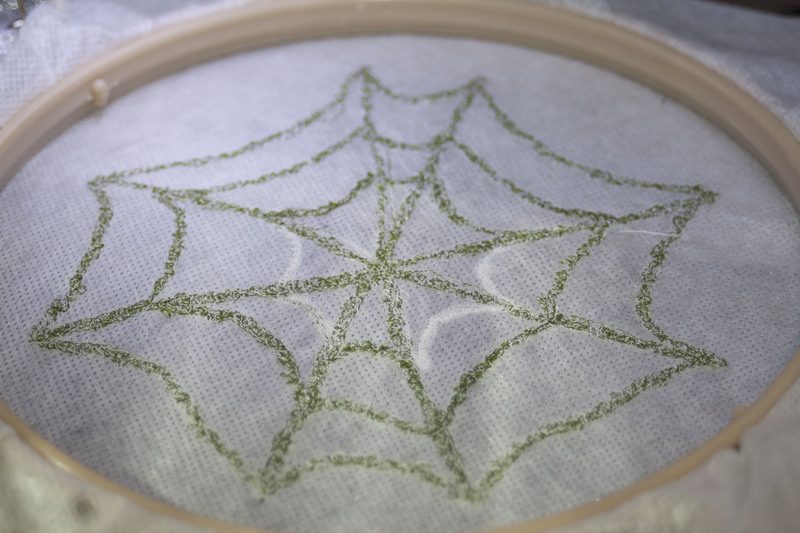 I drew my first web with a non-soluble pen and it transferred to the thread when I dissolved the stabilizer. The resulting web looked very dirty. 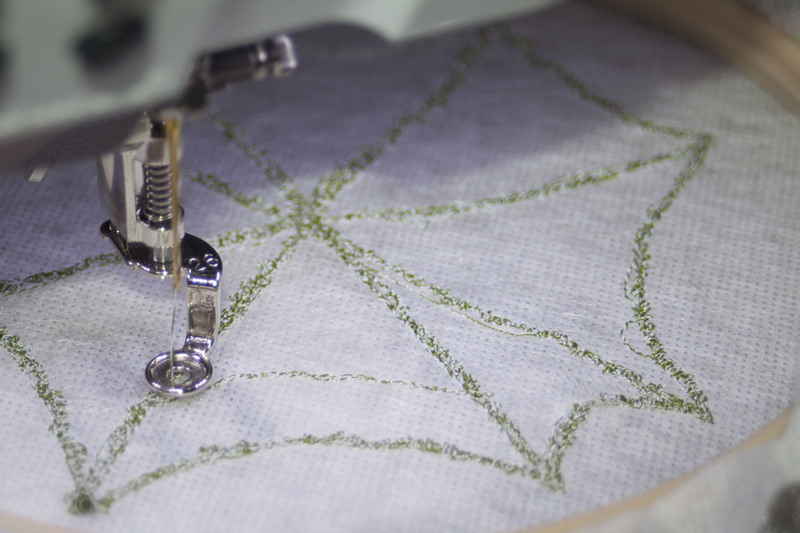 After drawing a few webs I felt comfortable enough to go ‘off-road’ at the sewing machine. 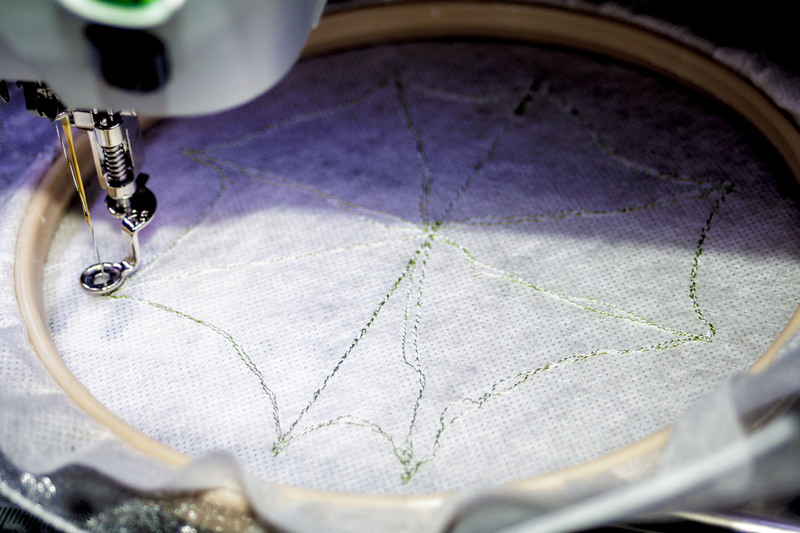 The first stitches are an ‘asterisk’ shape which form the skeleton of the web. I found that setting the needle speed at approximately midway between the slowest and fastest kept thread breakage at a minimum. The needle will be going fast, but your movements should be slow and deliberate. First lay down the base stitches–I stitched the lines upon which I would build the design. I usually went over the lines twice. Next I went over the spiderweb ‘straight’ lines with a tight looping stitch. 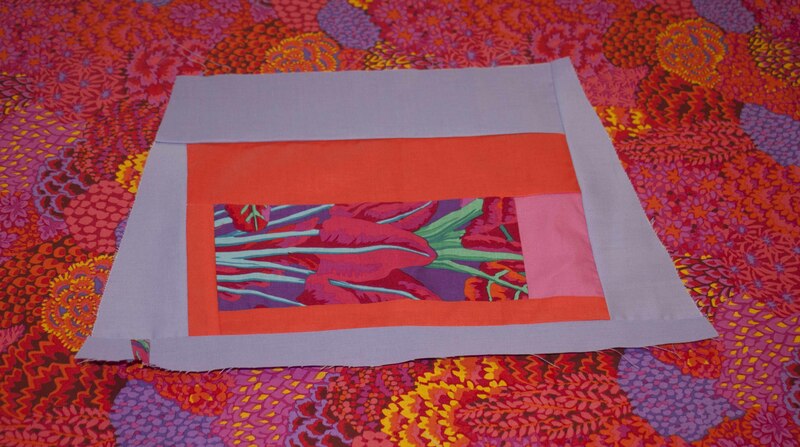 In the above picture you can see both the straight lines and the beginning of one line of the looping stitch. Watch that you do not have excessive thread build-up in one place, you don’t want to pull your needle out of the needle bar or break your needle. The width of each line when finished should be 1/8 inch. When stitching the outer lines of the web be careful not to bump into the hoop with the presser foot. Also I noticed that my hoop was not travelling smoothly because my sewing surface was not completely flat–I used my Silicone Slider to fix that issue. After stitching the skeleton of the web and the outer shape I stitched the inner lines. 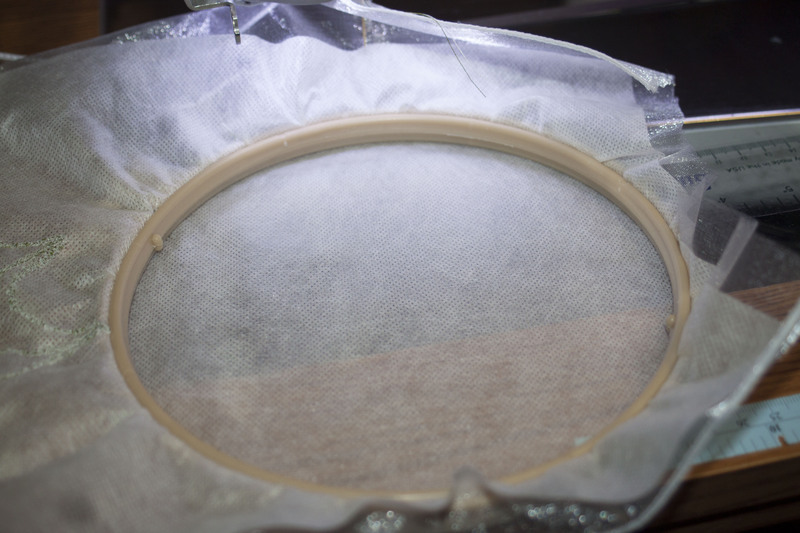 Once you have completed stitching the web, remove it from the hoop and following the manufacturer’s instructions dissolve the water soluble stabilizer. 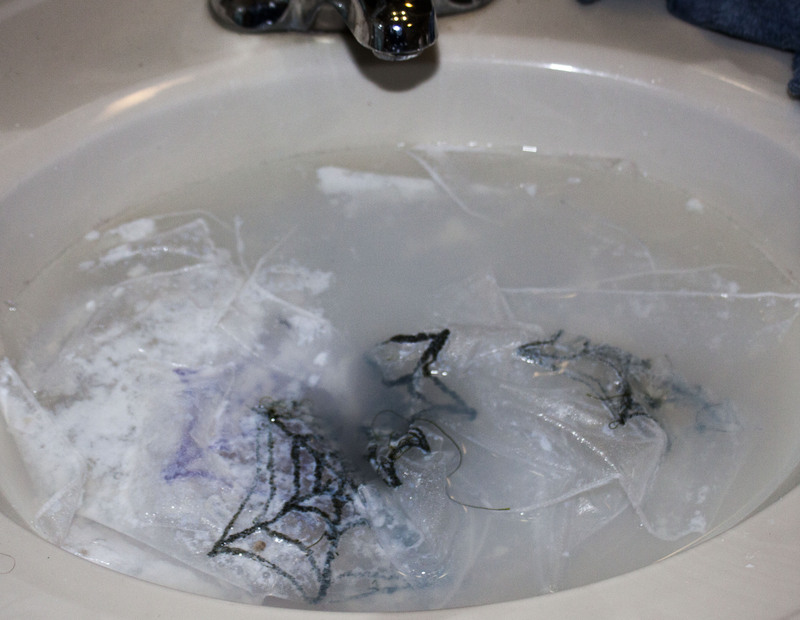 Remove the webs from the water, dry them in a towel and press them. 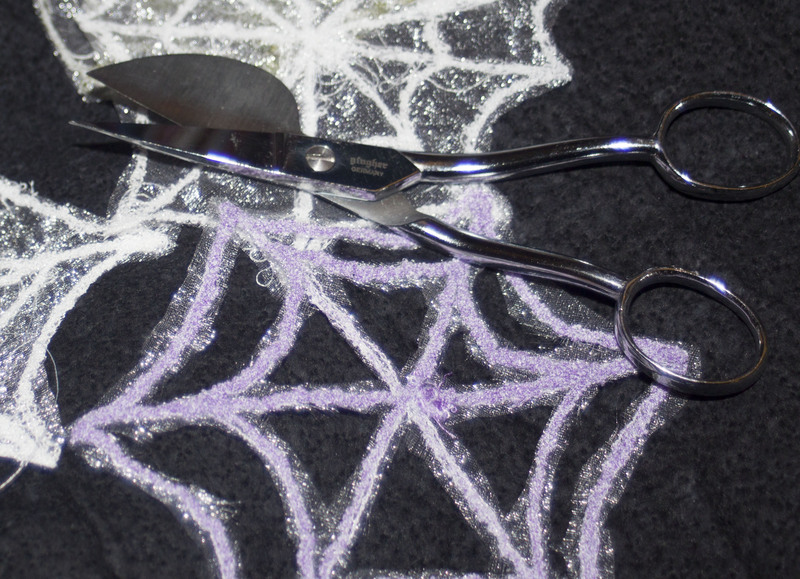 I then carefully cut the organza out of sections of the web to add to the ‘webby’ illusion. Arrange them on the quilt and tack them down with a few stitches. 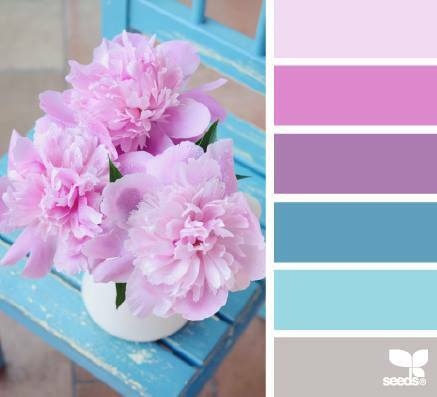 It is so funny that Monday’s quilt was about Peonies and today’s inspiration photo was Peonies. I truly hope to see Peonies in the garden this year and roses. I feel so fortunate to have been able to take a class with Jacquie Gering of Tallgrass Prairie Studio. I took the Modern Log Cabin Makeover with two friends and each of us left the class with totally different projects. We learned several ways to piece together a log cabin block, but we also learned how to design our own unique interpretation of the log cabin. Jacquie was absolutely wonderful as a teacher: the fabric and supply lists given out prior to class were clear, complete and gave us options for fabric choices; her presentation was well-organized; she gave clear handouts (so we can continue our designs at home); she gave each student in the classroom individual attention and affirmation; she had quilts to illustrate each of the different possible log cabins; she had a great sense of humor and was willing to learn from her students. In fact, one of my friends, Pam, convinced Jacquie that ‘hot pink’ is the ‘new’ neutral. Some students walked into the classroom totally comfortable with improvisation/wonkiness and others were not. Despite these differences, Jacquie inspired each one of us to push our boundaries. I think that everyone walked out of the class feeling good about their design and feeling good about themselves. 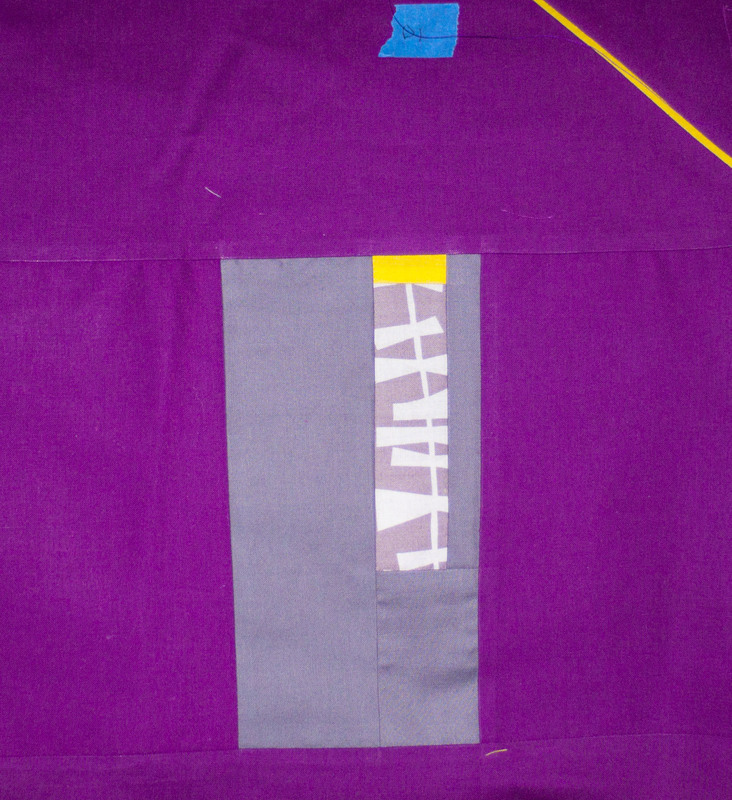 I walked into the class with the very beginnings of an idea–purple blocks on a gray background. 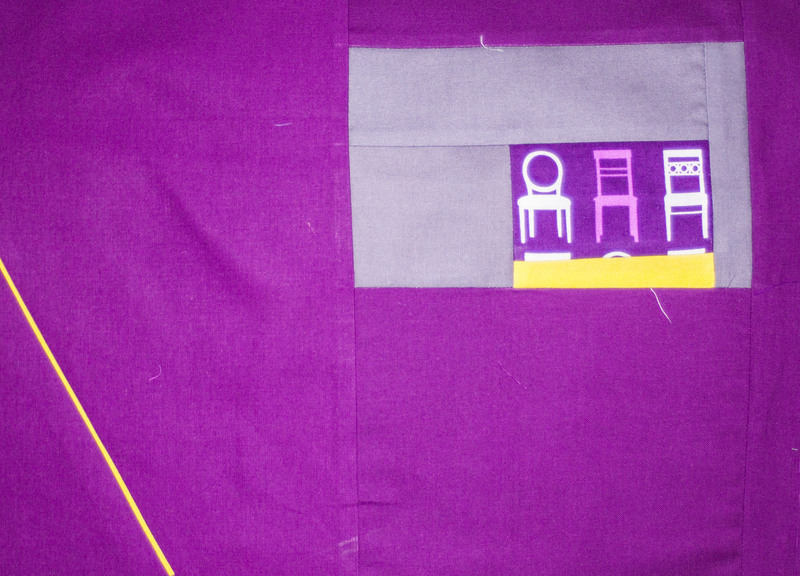 Thanks to Jacquie holding my fabric up I changed immediately to a purple background and started piecing “Minimalist” log cabins. I think I just needed her permission to ‘go bold’. 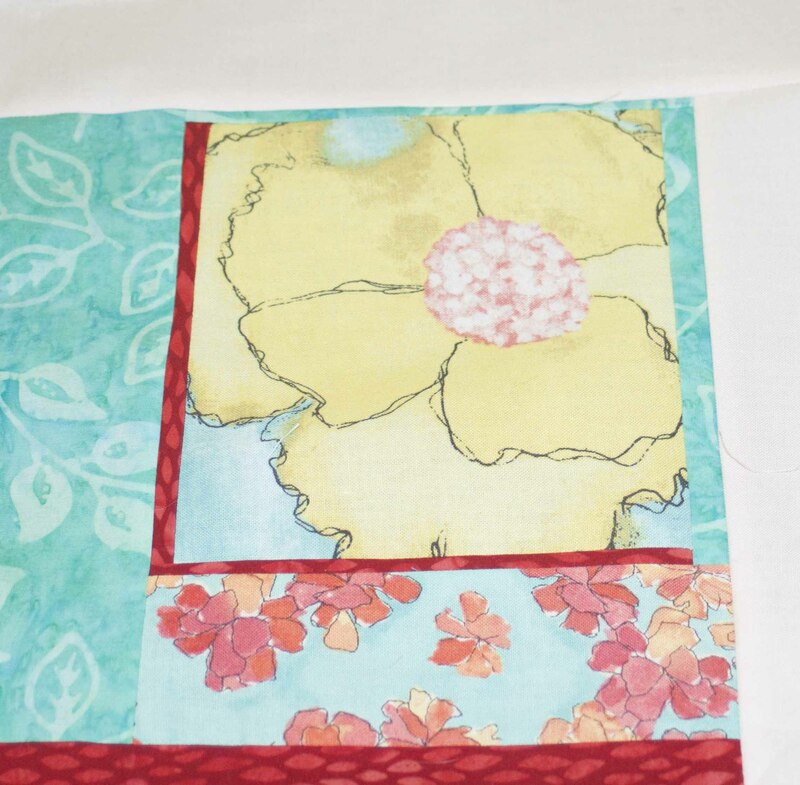 I wanted to put slivers of yellow in and around the blocks. Jacquie loved this idea and supported my experimentation with it. She helped me feel confident about finishing the quilt at home. 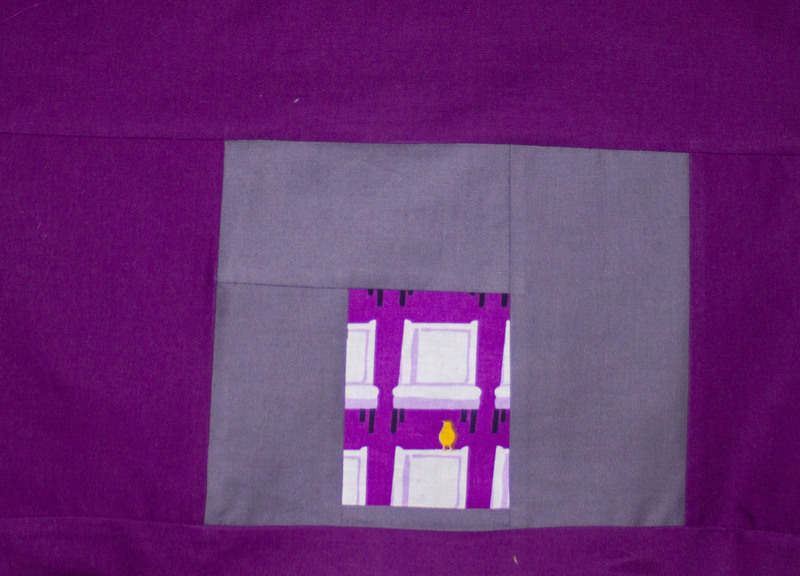 I finished the piecing the blocks at a quilting day with friends at a local church I started using painter’s tape (a method from Jacquie) to put the blocks on the wall so I could see what they looked like, the pastor walked in and asked anxiously how I was affixing them to the wall. lol. (No churches were harmed in the production of these blocks). During class we learned the importance of auditioning (trying out) fabric on a design wall, walking away, analyzing and then sewing. We also learned that we needed to use math to finish the blocks so that they fit together and make a quilt. 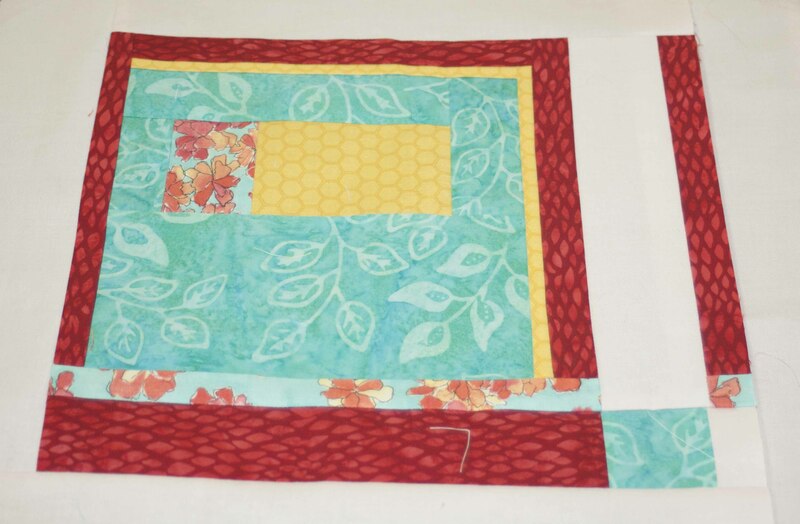 In addition, we learned her method of ‘paneling’ blocks in larger and larger groups to form the quilt top. 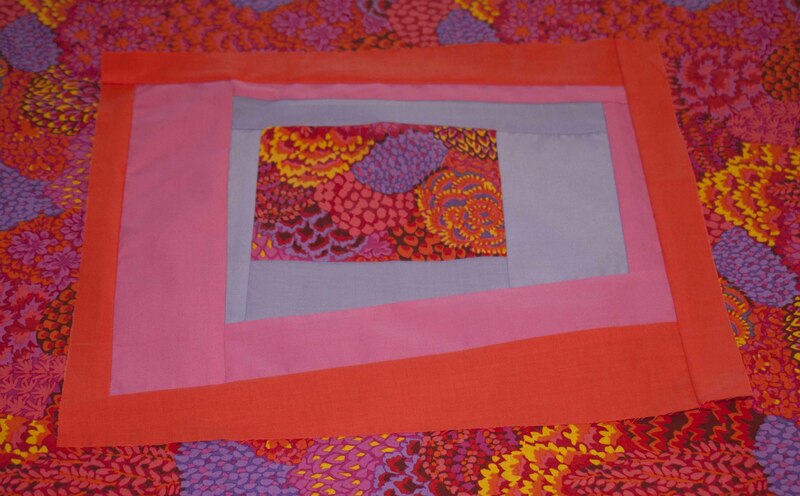 I can hardly wait to finish sewing my top and quilt it. I’ve marked each block with painter’s tape ‘addresses’ because I’ve been working on them in various places and I don’t want to get them mixed up when I assemble the top. Pam’s blocks were originally going on a hot pink background, but, after auditioning it, Pam was underwhelmed. 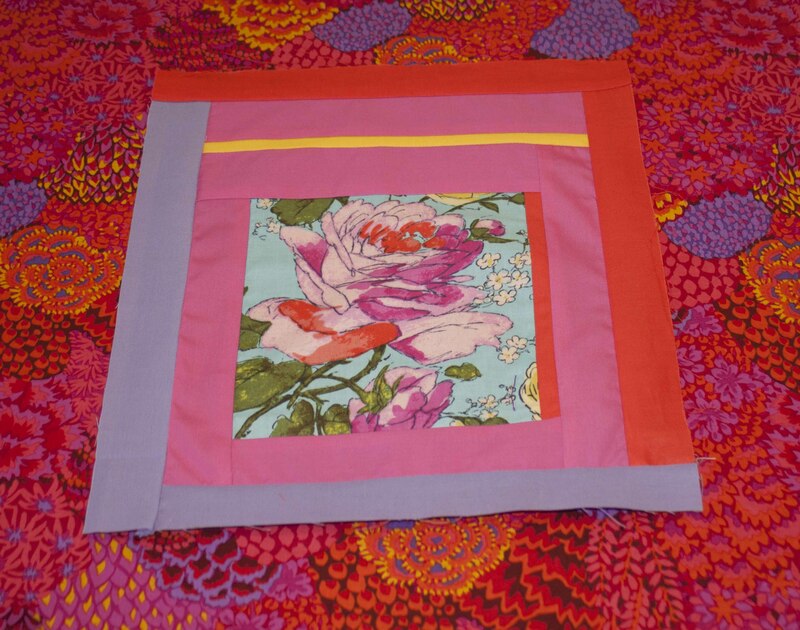 Next, she tried the Kaffe Fasset print and it.was.gorgeous. Pam is ready for the ‘math’ part, but I think that she is deciding how many blocks she wants in her quilt and how large she wants to make it. 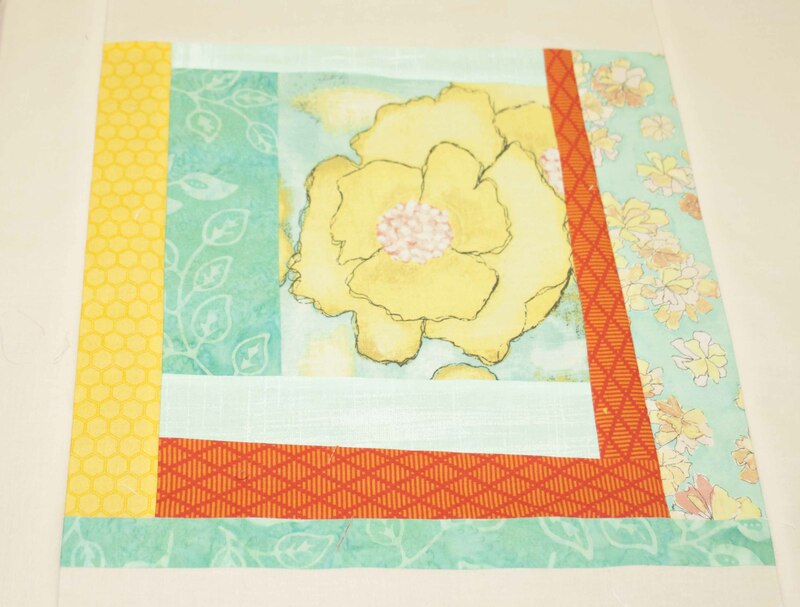 I love JoAnn’s use of the red and orange throughout her blocks and those big beautiful flowers. She is almost ready to piece together her top. I’m excited to see what it will look like!! I think that her blocks look like a perfect summer day, all I need now is a glass of lemonade.